At Monash Sport we understand the importance of an all-encompassing welcome to university for new students. Orientation Week, Wominjeka Monash and Enrolments are all key touchpoints of the new student journey into university. Monash Sport recognised this, and took the opportunity to have an active, physical presence at these events and initiatives. ‘Active’ to us meant engaging new students through the use of fast, exciting activities such as; giant connect 4, Quoit challenges, ‘Come and Try’ sessions, Beach Days and Bike’n’Blend (pictured above); we feel this is just as important as handing out information collateral when it comes to active engagement. Throughout this period, we assisted and engaged with nearly 3000 students across Caulfield, Clayton and Peninsula. A presence on campus was not the only support Monash Sport provided. We also ensured our facilities were opened to a range of Faculties for induction and orientation programs. With over 3,300 students coming through our facilities for these programs across Caulfield, Clayton and Peninsula campuses, we are confident in our assistance in the overall student engagement and welcoming process. Our ‘1 week free trial’ was taken up by nearly 900 new facility users over the February period, across Caulfield, Clayton and Peninsula campuses. This gives those students the ability to experience the full Monash Sport offering, including Fitness Centre access, Group Fitness Classes and Swim, Spa and Sauna access with no financial commitment. 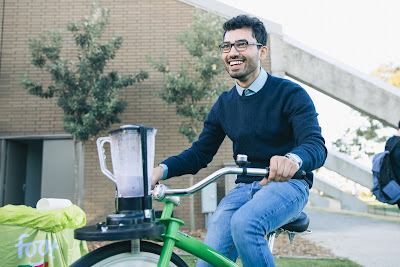 The ability to introduce so many students to creating healthy habits, and experiencing a full campus experience through these programs was, and is, a key driver in our strive for constant innovation and commitment to the overall student experience at Monash University.